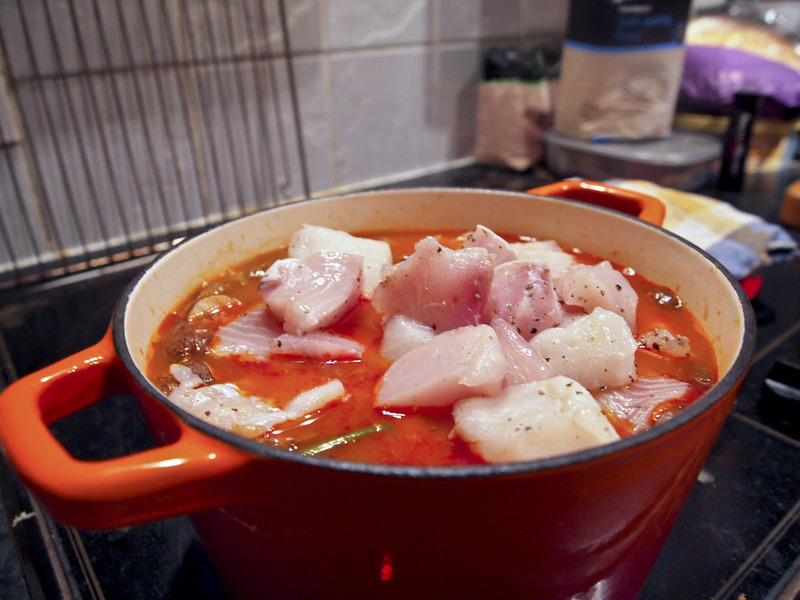 Fish stew might be a bit of a misnomer, as this dish doesn't require the hours of cooking and er...stewing, that a traditional stew needs. It's more of a fish soup, prepared in little under an hour. 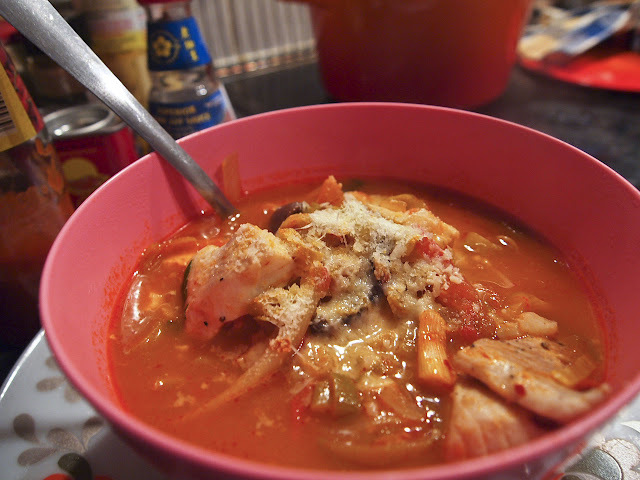 The soup is enriched with some harissa paste and topped off with grated Parmesan for a spicy, thick texture. Sometimes you just crave a good helping of those piscine pals. - Cut your fish up into cubes and season them with salt and pepper. Set them aside for later. - Add some butter and olive oil to a pot on medium heat. Dice up your onion and garlic, and cook until soft and translucent. Slice up your fennel and leeks, and add that to the pot. - Pour your white wine** into the pot - you can add more or less, depending on preferences. 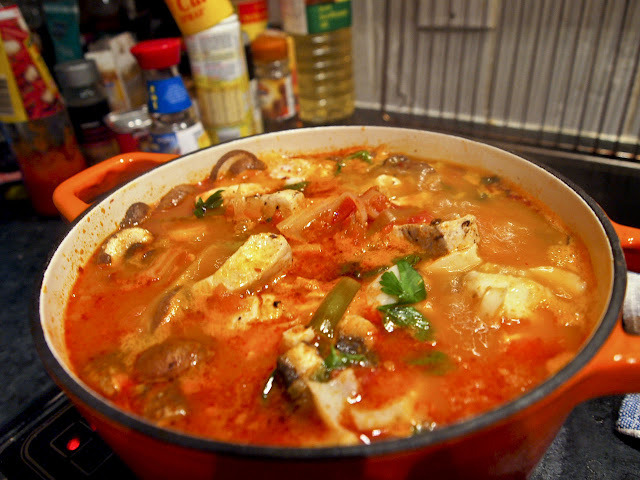 Dice and add the fresh and tinned tomatoes, then put a lid over the pot and let it stew about about half an hour. You can also add some fish sauce or salt to taste. - Check on your mixture about about 20-30 minutes. You should have a thick, red stew bubbling away now. Stir in your chilli/ harissa paste, place the fish on the top and cover it up with a lid. - Remove the lid after 10 minutes. The fish should be cooked through by now. Take the stew off the heat and ladle into bowls. Top with some grated Parmesan and garnish with basil and parsley. Serve with good, crusty bread! * Shellfish such as prawns, and mussels, and even squid or octopus would work wonderfully in this dish. **You can also use stock or even water in place of white wine. You may have noticed some mushrooms in the photos here - I did use them last night because we had some we needed to finish up, but I wouldn't generally recommend them when making this soup as I don't think they add anything to it.